You are here: Home / Uncategorized / Summer before Spring? 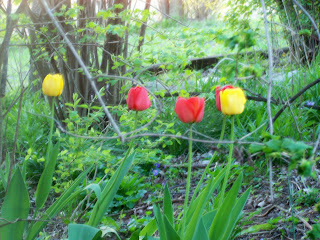 Our tulips in the yard are loving this warm weather! It’s a sweaty 91 degrees in PA today! Earlier in the week we had some frost on the cars in the morning. Go figure! Yesterday it was 86 degrees but we had a nice breeze, so it didn’t feel that warm, no such luck today! Thank goodness there was no humidity, so the 90’s were also tolerable today. Not much going on here, preparing for another busy week of work, varsity softball games (Mon, Tues, Thurs & Fri. this week) and everyday chores! Hopefully I can fit some sleep in there sometime. Dylan is working hard at keeping his grades up. He missed distinguished honor roll by one tenth of a point last marking period. He’s growing like a weed. Getting taller and filling out like a teenager. He chose not to play any sports this year, so his physical activity is riding bike and doing yard work. He really enjoys the computer, especially making DVD presentations and mini movies. Devyn started umpiring softball this week. This is her senior project that you have to do when you are a junior. ?? So, she has also turned it into a part-time job. She needs a job, she’s expensive! Prom, travel ball, class dues, sneakers, hockey tournaments, car, insurance, gas…the list seems never ending. 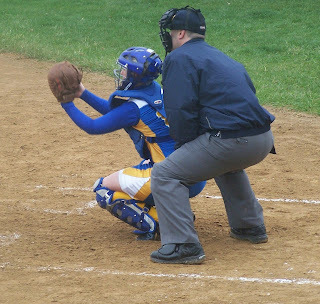 Just in case your confused, Devyn is the catcher in this picture, not the umpire. 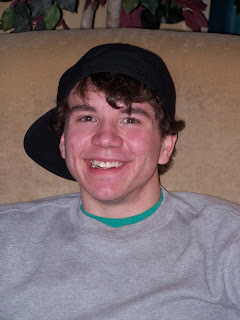 Dustin is finishing up his last class from Hacc. Final in 2 weeks. He has to complete a CO OP job in auto mechanics then he will earn a certificate in Auto Mechanics. He can transfer those into a degree, as soon as he grows up and actually decides what he plans to do. In the mean time, he will be working full time at Giant as a night crew stocker. He likes the job and has been working there now for 1.5 years. He just might just follow in his Uncle Joe’s footsteps and work his way up the ladder at Giant. There are a very good company to work for & treat the people who really want to work and succeed with a lot of respect. Enjoy the upcoming week. Looks like PA should be warm and sunny most of the week, with a chance of showers on Friday. Check back soon, next time I will update about Dan & myself. We do exist, too! !